I have recently, on 24. Juli 2018, released a new EDM/Progressive House Song. Named it Tour de France. You will hear the „etape du tour mix“, an original dance tune with vocal insertions. Dramatically restaged the final etape musically, with a lot of progressive rhythm effects, e.g glitches and slides, vinyl repellence and scratches. This song spreads also a maritime flair through marimba synth melody. Sidestep to tropical house is a possible explanation, but i wanted to produce a dance track that sounds hot. The album art shows a spotlight, graphical refurbishment of the musical theme i have composed. 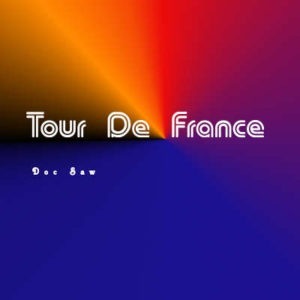 Since the tour de france leads to french landscapes the colors of the album cover remind on traditional flag colors, and on german flag colors because Doc Saw is a german musical project. Simply made but nice looking and very sporty album opener, i think. I am very pleased if you like my new album and download it at the google play store for your devices. It is produced in an awesome quality, and you will get a terrific sound file for listening on your earphones, or smartphones.